© Tao Dao - bone structure of Daodejing #36 (English commas added). Above the 'one' is 八 (bā), which is shown as 丷 in traditional characters, and today usually implies the number '8', but historically implied 'divide', although, some references suggest that it might could simply imply 'hair' on one's head, and also, older scripts of the symbol might have implied 'river', or 'streams joining', but, nevertheless, 'divide' is the favored choice for the moment. Dao... without use of memorized numbers, without use of memorized words, without use of memorized mathematics, without use of measure words, without help from anyone else, divide one oneself. Self-observation, combined with self-thinking... might sound easy... but the acts of self-observation and self-thinking, are not possible for most people. Observe, find, and learn from one's self, what 'divide one oneself' means... to self-observe how the mental division occurs... to self-observe one's own thoughts... to self-observe how the division of 'one' was reasoned... then, the useful next step... to vocally describe the mental process itself... to describe, with fine details, without using measure words, and without using numbers. Fewer than one person in 10,000 is able to meaningfully describe even a tiny portion of their own thoughts... only a few rare individuals are known to be able to describe a single drop of water... only a few rare individuals are known to be able to describe a single thought... most people are fully not able to self-think at all. Many individuals continue to discuss what the word 'dao' means within Daodejing... but, the word 'dao' will always mean whatever a person wants it to mean, and, the meaning will never share an equal, same, nor identical meaning as anyone else's. 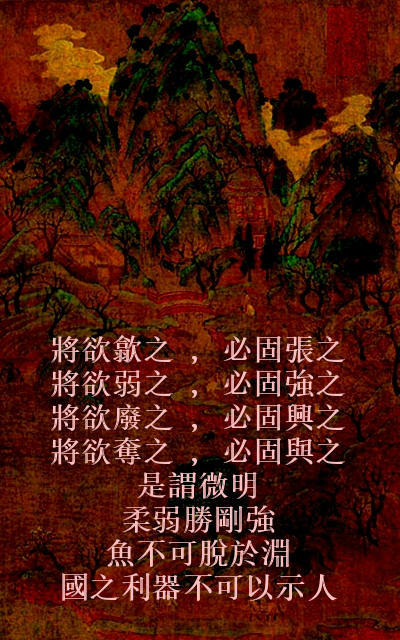 When able to self-observe while self-divide, then better able to understand what is right, and what is wrong, with the words 'happy anger, sorrow joy, it have-not expressed, call it middle...' (中庸 Zhong Yong draft translation). To be able, to self-think while one's self is living each moment, the individual is close to having made a very tiny, little, baby step, towards being capable of reading, and walking, Daodejing's first word... 道.